Pasukan Marinir II / "PASMAR II" (Marine Force II) based in Surabaya for operations in the eastern fleet of Indonesia. The two marine divisions (PASMAR I and II) are each led by a one star admiral (Brigadier General/Commodore). 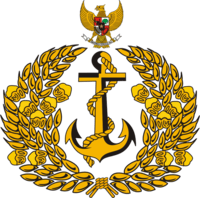 Starting from the establishment of the Corps Mariniers (CM), the predecessor of the marine corps on 15 November 1945 at Navy Base IV of ALRI (Angkatan Laut Republik Indonesia]] in Tegal. The marine corps was initially formed as a training for Indonesian seamen who joined the Navy, in order to fight on the ground when there is an emergency. The marine eventually was forced to join guerrilla warfare on land due to lack of sea defense equipments. In other places, the Navy infantry were widely known as the "ALRI Gunung" (Navy of the Mountains) because it is more frequent fighting in the jungle and the foot of the mountain, rather than at sea. But they are not included yet in the marine corps for this latest new corps at that time only exist in Navy Base IV in Tegal, not in other naval bases. The marine corps from Tegal sent troops to Semarang front of the Revolution 25 times to aid the People's Security Army (TKR) who was losing to the Dutch. In the midst of the revolutionary period, precisely on 17 March 1948 there have been a reorganization and rationalization of the marine corps. At that time, because the marine corps have a lot of combat experience on the ground, the government decided to separate it from the Navy. Corps Mariniers was then merged into the Diponegoro Division of the army by the name of Samudera Regiment and was divided into five battalions. Marine soldiers who wishto remain in the navy must submit a written request to the Minister of Defence and Commander in Chief of the Armed Forces Car. On October 9, 1948, the Minister of Defense ratified Decree No. A / 565/1948, declaring the establishment of the marine corps. Nevertheless, the acceptance of new personnel only started after the Round Table Conference (RTC) in 1949. Selection reception was held at the main naval base in Surabaya. Approximately 1,200 recruits were selected to join the new naval amphibious forces. After being examined, it turns out 95 percent of the 1,200 people who received it are personnel are formerly part of the Corps Mariniers established in Tegal. Of all the personnel of the Korps Komando Operasi Angkatan Laut (KKO AL) recorded in 1950, 90 percent of the personnel were formerly part of the Corps Mariniers . Therefore, the existence of marine Corps formed in 15 November 1945 as mentioned in the previous paragraphs, justified as the forerunner of the Navy Marine Corps today. The marine crops has been active in various military operations in Indonesia. 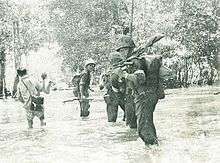 One of the largest amphibious military operations would have been Operation Jayawijaya in which thousands of marines were planned to land on Biak in 1963 as a part of the Trikora Campaign to take West Irian from Dutch control. The operation was aborted as a consequence deals preceding the New York Agreement. At the height of the Indonesia-Malaysia Confrontation, Harun Hj Mohd Said and Usman Ali (hereinafter known as Usman Harun), two members of the Marine Corps were dispatched to Singapore using rubber boats. Their main task is to infiltrate and sabotage the interests of Malaysia and Singapore. In practice, these operations are only able to blow up the MacDonald House and cause civilian and non-military casualties. In that incident, 20 fruit shops around the hotel was heavily damaged, 24 pieces sedan vehicles were destroyed, 30 people died, 35 people suffered serious injuries and mild. This incident is known as the MacDonald House bombing. Usman and Harun were unable to escape from Singapore and was eventually arrested and sentenced to death by the Singapore government. In 1999 a plan was proposed to expand the Kormar from its strength of 13,000 troops. Based on this plan, every Kormar's base would have three combat brigades: the Infantry, Cavalry, and Artillery and would be supported by one Combat Support Regiment and one Administration Support Regiment. The expansion will create three Kormar bases: Surabaya for Eastern area command, Jakarta for Central area command, and Rate Island in Lampung for Western area command. 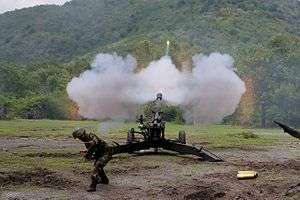 Now the Indonesian Marine Corps has an estimated 29,000 troops in two Marine Forces (PASMARs) and one independent infantry marine regiment, when combined equal to one over-strength infantry division, which includes its own sizeable mechanised amphibious and artillery units. PT-76 Medium tank USSR PT-76B 70 All re-gunned with Cockerill 90mm with assistance from private company and received improved fire control system and engine upgrade. Not all operational. BTR-50 Amphibious armoured personnel carrier USSR BTR-50PK 70 All upgraded with new engine, radio system and smoke grenade launchers on some vehicles. BTR-80 Armoured personnel carrier Russia BTR-80A 12 Currently deployed by Indobatt Contingent on UNIFIL mission in Lebanon. LVT7 Armoured personnel carrier United States LVT-P7A1 10 All donated from South Korea. ↑ "NEWS STORY: Riwayat Marinir yang Pernah Dipisahkan dari TNI AL"
↑ Indonesian report in Reuters archives: INDONESIA: OPERATION "DJAJAWIDJAJA" OF THE NAVY. ↑ IDB. "Sertijab Dankormar". Retrieved 24 December 2014. 1 2 3 NurW. "DEFENSE STUDIES". Retrieved 24 December 2014. 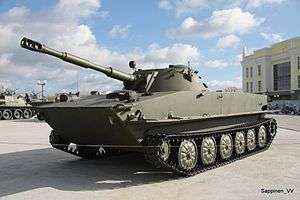 1 2 "Russia to deliver 37 BMP-3F amphibious armoured infantry fighting vehicles to Indonesia". 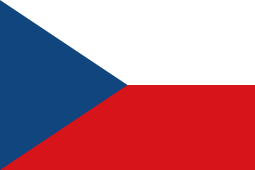 27 January 2014. ↑ "Indonesian Marines BTR-50PK, with some modifications like the smoke dischargers." 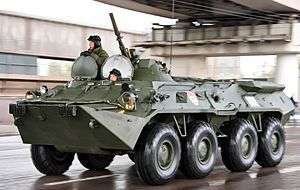 ↑ "BTR-80A : Monster Amfibi Korps Marinir". IndoMiliter. Retrieved 24 December 2014. 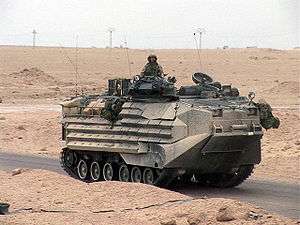 ↑ "BMP-2 : Tank Amfibi "Sangar" & Battlle Proven". IndoMiliter. Retrieved 24 December 2014. ↑ "PRINT KOMPAS". Retrieved 24 December 2014. 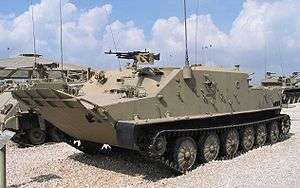 ↑ SpetsTechnoExport of Ukraine awarded contract to supply 5 BTR-4 8x8 armoured to Indonesia - Armyrecognition.com, 24 January 2014. ↑ "Ukraine to supply 50 BTR-4 armoured personnel carriers to Naval Forces of Indonesia (TNI AL)". March 15, 2014.